Our necks are often subjected to repeated stress and minor injuries over time. These injuries may not hurt initially, but repeated injuries add up and can eventually result in cervical spine degeneration. Most neck pain is due to degeneration, which makes it highly important to take preventative measures. 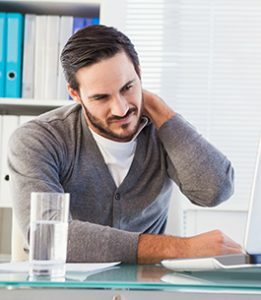 The overall condition of the cervical spine usually determines how quickly you recover from an injury, and whether your neck pain will become a chronic, ongoing problem. For chronic neck pain, there may not be a quick fix or a complete cure. For this reason, you should see a spine care expert about your neck pain as soon as possible. 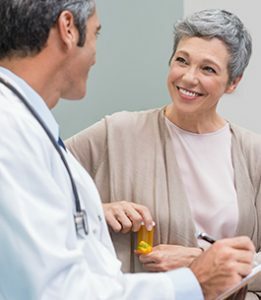 Work with your health care provider to address the problem and slow down the degenerative process. The physician’s role in the treatment of neck pain is to find the main causes that need to be addressed. He or she will also try to keep your neck pain from becoming a chronic condition by teaching you how to slow down the degenerative process and prevent further injury. Below you can learn about the causes and symptoms of neck pain. Get in touch with The Spine Care Center to request an appointment! To help you understand disc degeneration, compare a spinal segment to two vanilla wafers (the vertebrae) and a marshmallow (the disc). Imagine a fresh marshmallow between the two wafers. When you press the wafers together, the marshmallow gives or “squishes out.” Suppose you leave the marshmallow out for a week and it starts to dry out. When you press it between the wafers again, it is not quite as spongy as it once was. If you press hard enough, the outside of the marshmallow may even tear or split. Suppose you left the marshmallow out for a month. It would probably be so dried out it would be hard, thin, and would not have the ability to absorb shock. As we age, our discs become a lot like the marshmallow in the example above. They lose some of their water content and, as a result, some of their ability to effectively absorb shock. Like the marshmallow, the first changes that occur in the discs are tears in the outer ring, called the annulus. Tears in the annulus may occur without symptoms, so you may not notice when they occur or what caused them. These tears heal by forming scar tissue, which is weaker than normal tissue. Repeated injuries and tears cause more wear and tear to the discs. As the discs wear, they lose more of their water content. They become less and less spongy, eventually no longer able to act as shock absorbers. As the discs continue to wear, they begin to collapse. The space between each vertebra becomes smaller. The collapse also affects the way that the facet joints in the back of the spine align. Like any other joint in the body, the change in the way the bones fit together causes abnormal pressure on the articular cartilage, which is the smooth, shiny material that covers the ends of the bones in any joint. Over time, this abnormal pressure causes wear and tear arthritis (osteoarthritis) of the facet joints. Bone spurs may form around the disc and facet joints as a result. Eventually, bone spurs can form around the nerves of the spine, causing a condition called spinal stenosis. A chronic neck ache where the pain is located mainly in the neck may be the result of degenerative disc disease and arthritis of the facet joints of the cervical spine. Doctors sometimes refer to this type of pain as mechanical pain. This term is used because it gets worse by using the joints, muscles, and discs that allow the head to move freely. Mechanical neck pain is not caused by pinched or irritated nerves. Rather, the pain seems to come from inflamed facet joints and from disc degeneration. The discs and facet joints become more inflamed with motion, and the muscles around the cervical spine begin to spasm, which is like a muscle cramp. Spasms are your body’s way of trying to stop the movement in the cervical spine, and they can often cause pain. When a nerve root leaves the spinal cord and the cervical spine, it travels down into the arm. When a nerve is irritated or pinched by either a bone spur or part of the intervertebral disc, it impairs the nerve’s ability to function properly. This shows up as weakness in the muscles the nerve controls, numbness in the skin where the nerve goes, or pain in the area where the nerve travels. This condition is called cervical radiculopathy. There are three main causes of cervical radiculopathy: herniated discs, spinal degeneration, and bone spurs. Injury to the disc may occur when neck motion puts too much pressure on the disc. One of the most painful injuries that can occur is a herniated disc. In this injury, the tear in the surface of the disk is so bad that part of the inside of the disk squeezes out. A tear or rupture can occur anywhere around the disc. If it tears on the side next to the spinal canal, then when the inside squeezes out, it can press against the spinal nerves. Pressure on the nerve root from a herniated disc can cause pain, numbness, and weakness along the nerve. Chemicals released from the ruptured disc may also irritate the nerve root, leading to some of the symptoms of a herniated disc especially pain. In middle-aged and older people, degenerative disc disease can cause bone spurs to form around the nerve roots. A bone spur is an abnormal bone growth that usually occurs inside the neural foramen, the opening in the cervical spine between two vertebrae where the nerve root leaves the spine to travel into the arm. If these bone spurs get large enough, they may begin to rub on and irritate the nerve root. This causes the same symptoms as a herniated disc: pain that radiates into the arm, numbness along the nerve path, and muscular weakness. Perhaps the most serious of the problems caused by degeneration of the spinal segment in the cervical spine is the condition called spinal stenosis. Spinal stenosis is caused by bone spurs in the late stages of spinal degeneration. As the bone spurs form, the size of the spinal canal becomes smaller. The bone spurs begin to press on the spinal cord or the nerve roots, which can cause numbness, tingling, and pain in the arms, hands, and legs. When there is a narrowing of the spinal canal (the bony tube through which the spinal cord runs), the whole spinal cord may be affected. This is different than when the bone spurs only narrow one of the neural foramen. A pinched nerve from either a herniated disc or a bone spur rarely affects the legs, but cervical myelopathy can affect both the arms and the legs.